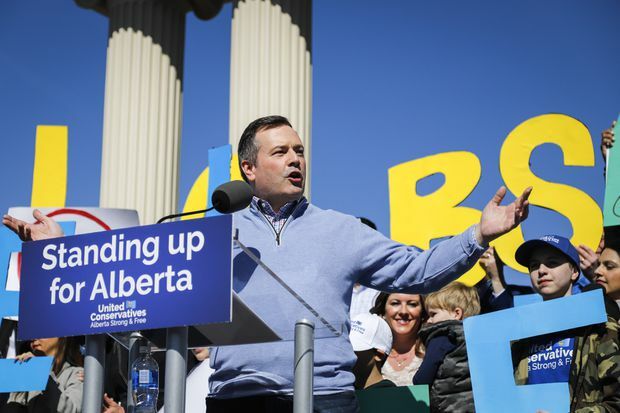 Jason Kenney attends a rally as part of the UCP campaign platform roll-out in Calgary on Saturday, March 30, 2019. Alberta’s United Conservatives say balancing the books will require a freeze on government spending at current levels for four years and if they are elected they intend to replace the province’s carbon tax with a new tax on large industrial emitters. Following four years where Alberta’s New Democrats posted large deficits and poured billions of additional dollars into health and education budgets despite a slumping economy, UCP Leader Jason Kenney unveiled a party platform Saturday that projects tax cuts and a spending freeze would lead to a $714-million surplus by 2023. The NDP has projected a balanced ledger the following year. The UCP Leader rejected suggestions that four years of frozen budgets, which would not compensate for inflation or the province’s growing population, would require cuts to services. “It’s completely misleading to say that a freeze is a cut. If your household budget is frozen for a couple of years you don’t say you’ve lost income, you’ve maintained your income,” he said. According to Mr. Kenney, a UCP government would strike a commission to find low-priority spending which would be redirected to high-priority areas. Among the spending he’s already said he would cancel is NDP Leader Rachel Notley’s $3.7-billion plan to ship crude from Alberta to the U.S. Gulf Coast in thousands of railcars leased by the government. The UCP said that under their plan provincial debt in 2023 would hit $86-billion rather than the $101-billion expected in the Alberta government’s last fiscal update. Alberta had no net debt as recently as 2015, according to data from the Royal Bank of Canada. “Jason Kenney wants Albertans to believe he can ride to the rescue with billions in tax breaks for corporations … his plan won’t work,” NDP candidate Sarah Hoffman said in a statement. “No matter how they’ve voted in the past, Albertans are seeing Kenney’s corporate tax scheme for what it is: help for those who need it least, and a whole lot of hurt for everyone else.” The New Democrats are expected to release their full platform on Sunday. The UCP’s plan would increase spending by $703-million over four years, representing a hike of about 0.3 per cent annually, with millions for campaign promises made by the party. The largest new spending item is $100-million for additional mental-health services. The second largest increase would see $80-million spent on a new government “war room” and advertising meant to defend Canada’s energy industry from criticism. Detailed for the first time in the 117 page platform is Mr. Kenney’s climate change plan, which would pivot Alberta away from the carbon tax introduced by Ms. Notley toward spending on research for technology that could reduce carbon emissions. The UCP Leader told reporters he expects millions in research, funded by a new tax on the province’s large industrial facilities, could focus on geothermal power, carbon capture and storage proposals. The new tax, known as the Technology Innovation and Emissions Reductions regime, would take effect on Jan. 1, 2020 and would apply to facilities that emit more than 100,000 tonnes of carbon emissions annually. Those facilities would need to reduce emissions by 10 per cent compared to their average emissions between 2016 and 2018 and continue to reduce emissions by one per cent annually. If they don’t, they need to purchase credits from a facility that has achieved even greater reductions or pay a $20-per-tonne tax. Alberta’s carbon tax is currently $30-per-tonne. Alberta’s current climate plan, which includes the carbon tax, is expected to reduce the province’s emissions by 50 megatonnes by 2030. Mr. Kenney said his plan would cut only 43 megatonnes by the same year. Coal-fired electrical plants which need to close by 2030 under federal law would be allowed to remain open indefinitely if federal rules change. The UCP would require coal facilities after 2030 to be as clean as the most efficient gas-fired plants. A 100 megatonne cap on oil sands emissions proposed by the New Democrats would be cancelled. A new hourly minimum wage of $13 would be introduced for workers 17 years and younger and the UCP would look at lowering the wage for alcohol servers. Alberta’s current minimum wage is $15. Provincial spending committed to new transit lines in Calgary and Edmonton would not change. The UCP would require universities to establish and comply with free speech policies based on the University of Chicago Statement on Principles of Free Expression. Ontario Premier Doug Ford instituted a similar rule after taking office.